I thought, perhaps, if I gave myself more time, I would have the words to describe my emotions and give some insight on my visits to Hiroshima and Nagasaki. But, as the days went on until it became a week and more, I realized that it will never be easy to describe. More importantly, however, is what it means to live through it on a daily basis. I chose to stay at a small hostel near Miyajima Island, about half an hour outside Hiroshima. (Side note: if any of you ever get a chance to visit, this island is the most beautiful thing I have ever seen.) In speaking with several other travelers and friends at the hostel, I heard how moved they had been during their visit, many of them to tears. I became nervous in anticipation of what my own visit would bring. As I got off the subway stop nearest the memorial, I climbed the stairs, knowing from travel websites that I would have a view of the A-Bomb Dome almost as soon as I got to ground level. I felt my heartbeat steadily rising and a strong sense of anxiety as I got closer and closer to the last stair. Reaching the sunlight and fresh air, I looked to my left and was shocked with the shell of a building, the remains of what was once the pride and joy of a city. I slowly walked closer to the building, taking in the sights, smells, and sounds. For the most part, everyone around the memorial was quiet, either reading the signs, taking photos, or just absorbing it all. The A-Bomb Dome has its significance because just 600 meters above it is where the first atomic bomb exploded, resulting in the strange pattern of demolition. In order to remind both the Japanese people and others of the harms of war, the city of Hiroshima decided to maintain the building as a memorial. Each and every day, the people of this city are reminded of the horror that was once cast upon the generations before them, and even some of them. I sat for a few hours across the river from the dome, reflecting on what it must be like to see such a vivid reminder of one's history on a daily basis. Hiroshima's skyline was eternally marked by a shadow of their past, and as I continued on with my visit, I saw how much this had changed their mentality of their present and future. Once I felt ready, I moved to the museum, interested to see how Japan had decided to share and reflect upon such a dark time in its history. When I visited South Africa, I remember being disappointed that many of our visits to historical sites were very clearly catered to us, as Americans, and I hoped this would not prove to be the same. I think, in some sense, I wanted to be challenged to reconsider my American identity, and I was hoping for some of that through this experience. Overall, the museum was much different from what I expected, although I'm not quite sure what I expected either. It started off explaining the events and timeline that led up to the bomb dropping on Hiroshima, and then a good portion of the museum described the aftermath and harm that the community faced. Featured in both the Hiroshima and Nagasaki museums were artifacts that were found after the bomb dropped: the glasses of a grandfather, a school uniform, the shoes of a wife, and—the one that hit me the hardest—a tin lunch box with an uneaten lunch reduced to ash. Although these artifacts would be painful to see regardless of their previous owners, what was most upsetting was that many belonged to young children and students, as those had been the primary victims of the bomb. I'm not sure whether I simply never learned this fact or blocked it from my memory, but in both Hiroshima and Nagasaki, the bombs were dropped very close to the center of the city, which housed dozens of schools. As a result, a good majority of those killed were young children. Even worse, although many died on impact or in the days following, many died years into their childhood as a result of radiation. One such story that I recall from my youth is Sadako and the Thousand Paper Cranes, which is featured greatly in the Hiroshima memorials. Some of the paper cranes Sadako made while she was in the hospital. After I passed through the artifacts section, there was more information on the physical bomb. A life-size model was created to help visitors understand how small the bomb actually was in relation to the damage it caused, and there was also information on the study of nuclear warfare at the time. Although I was learning quite a bit, I realized that I was incredibly frustrated. Only once had the museum mentioned the U.S., in stating that the bomb was American-made, but otherwise blame had essentially been left out of the picture. But, there were still a few exhibits left, so I gave the curators the benefit of the doubt. Surely the anger I was expecting would come soon. And, finally, I thought it had. I reached the final exhibit, the take-away of the museum if you will, and was ready to hear about what an atrocious act had been committed by the United States. Perhaps how Japan had moved on but they would never forget this atrocity, but I was stunned yet again. The final thoughts the museum left us with were that of policy change. The exhibit gave details on how the mayors of Hiroshima and Nagasaki, in light of the 70th anniversary of the bombs, had been advocating even more for the end of nuclear warheads. They, along with many other political leaders in Japan, had been asking the UN to work with them to eliminate these weapons altogether. Although they had faced much resistance, particularly from big countries like the U.S., they were optimistic. There were petitions for museum patrons to sign and the letters the mayors had issued to their own communities as a call to action. These political leaders said that they wanted to use their own pain as a way to prevent the suffering of others. They felt that this was their duty and responsibility. One closing sentiment that stuck with me was, "We want to eliminate the notion that, in order to have world peace, we must have the ability to destroy one another. Peace can exist without the potential for [nuclear] war." Leaving the museum, I was humbled by the desire for change, but also, I realized, quite angry. After seeing all the pain and suffering of these people—which they are still experiencing today as many survivors continue to live with the after-effects of radiation—I wanted to hear some sort of blame. I wanted the world to hear that this was the United States' fault. I was mostly upset because I knew that each time another country had harmed the U.S. in some way, we had done everything but "let it go." The U.S. is particularly good at finding ways to blame other countries for their wrongdoing and forgetting their own; in their own eyes, playing the hero. It's somewhat ironic because, just a few days after leaving Nagasaki, I was watching an episode of Mad Men to relax after a long day. In this episode, one of the partners of the firm, Roger Sterling, is strongly against the firm signing a contract with Honda because "they killed my friends." The absurdity of his misplaced anger in that moment—attending meetings with Honda executives and basically spitting in their faces—was too painfully accurate in that moment. I had to stop the episode before I finished. But, the more I thought about it, I realized nothing good would come of that. The Japanese people would harbor this anger, but would it change the actions of the U.S.? Probably not. "Kiyo no Arashi" (translates to Storm over Nagasaki) by Noritaka Fukami, a schoolteacher in the city who was exposed to radiation while helping other victims. This experience reminded me of the Freire quote I included at the beginning, in that it will often, if not always, be the minority group that must take on the responsibility of forgiveness. In taking the high road, Japan had not only allowed themselves to move forward after this time of suffering, but also given the United States a second chance in creating a positive relationship with Japan. During my time here, I have felt nothing but immense love from these people. I don't think I deserve it, but it is what has been best for the healing process of the Japanese, and I have benefited as a result. This is not to say that I think communities of color or countries made primarily of people of color must always take on the burden of forgiveness. Just that it mostly happens that way. However, I hope that in sharing this, my American friends can consider how we all (myself included) allow ourselves to be complicit in the suffering of others, simply because we have the privilege to do so. As Americans, we have economic and social capital that even the richest people in other countries may never attain. And we must see this as a responsibility, not a ticket out. It is my hope that as I travel more and to other countries, I will continue to feel this responsibility and never forget it. When I look back on these eight months, I want to be continuously reminded that it is my responsibility to stay conscious and aware of what it means to be American. Also, as a member of minority communities, I have been humbly reminded that it is often for our own benefit that we forgive, but not forget. For it is these memories that can drive us forward in seeking empowerment and change. Cenotaph for the A-Bomb victims. I keep pinching myself, expecting that I’ll soon wake up from this weird and crazy dream. Ten full days have already passed since I arrived in Japan and it still seems surreal that I’m halfway across the world in a country where I can’t communicate much more beyond hello, goodbye, and thank you. Tokyo skyline from the Metropolitan Government Building. The last week or so has both felt like an eternity and the blink of an eye. Spending my first six days in Tokyo ended up being fascinating because of its strange similarity to Times Square, but also the shock I received when I was not able to have a meaningful conversation with most people around me. Having spent the last few summers living in big U.S. cities, I had no trouble navigating public transit or other aspects of city life, but the issues came in ordering food (considering both the language barrier and all my dietary restrictions) or even trying to make friends in my hostels. I found myself trying to learn about a culture and country with no way to ask questions, or even just listen and learn. Yet, even without doing much communicating in my first few days, I was able to see and learn a lot. I spent my first day visiting the famous temples and shrines of Nikko, where I saw the historic appreciation for and representation of Buddhism in Japan. The next day, I was thrown into the opposite environment as I visited the crazy streets of Shibuya, Harajuku, and Omotesandō. These districts are known to be the go-to shopping neighborhoods in Tokyo, and with the shops come large crowds and Japanese pop culture. As I walked down the streets, it was strange to see stores like Zara and Louis Vuitton—reminiscent of 5th Avenue in Manhattan—but still have the street signs and conversations remind me that I was very much away from home. The third day, however, finally provided some insight for me into Japanese history and culture. 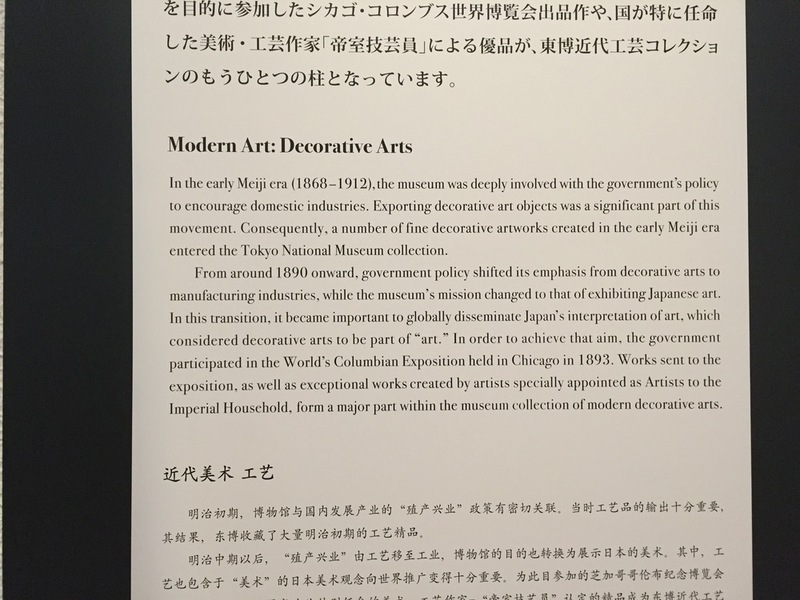 I visited the largest collection of Japanese art at the Tokyo National Museum and, mostly due to descriptions being in English, I was able to understand the progression of Japan from the traditional castles and the Tokugawa shogunate to today's bustling cities and skylines. 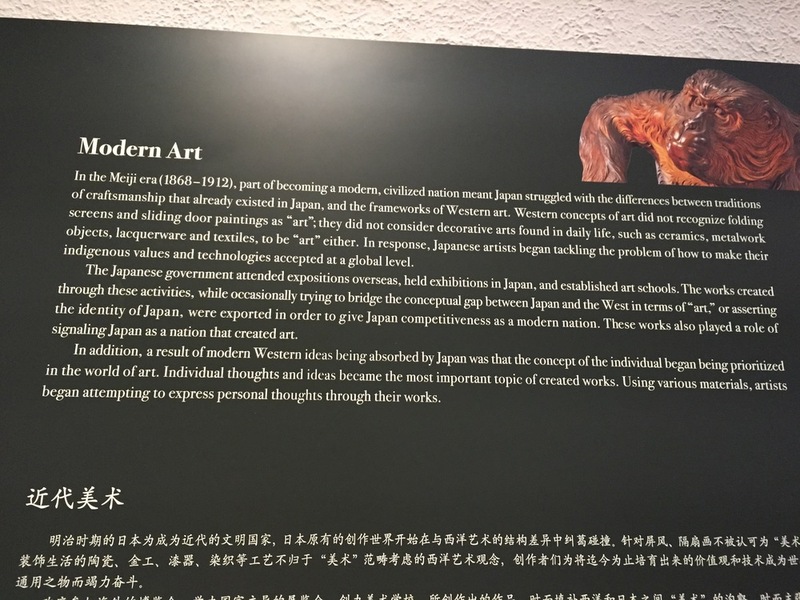 Although the museum started off with more traditional Japanese art, the section that caught my attention was from the Meiji period, which was when Japan shifted from its final stages of feudal society into a more Western form. Although many countries went through some sort of industrialization during the late 1800s to early 1900s, it is interesting to see Japan's somewhat active role in this process. Many descriptions in the museum (pictured below) discussed how the role of art came into play. Emperors and rulers of Japan realized that the traditional Japanese style was not appealing to the West, and so renowned artists were sent to Europe to study and make their art more appealing. Thus, although Japan was one of the few Eastern countries to avoid colonization in a direct manner, they were still impacted by the pressure to Westernize in order to "keep up" with Europe and the United States. The choice to become Western, then, was actually not one, but just another manner in which a non-white country was deemed lesser or not modern because of its decision to maintain its own customs and traditions. Nevertheless, Japan has kept much of its original culture, whether it is through its shrines, temples, and practice of Buddhism, or through the almost nonexistence of English throughout the country. They are one of the few non-white countries to be seen as "first world," but have still maintained a strong sense of identity. Although I found this fascinating, it has also been incredibly jarring. Many times while walking through the city streets, I would suddenly stumble upon a small shrine surrounded by skyscrapers. Other times, I would leave some of the most historical temples in Tokyo to be greeted by bright, neon lights and food stalls. This constant dichotomy between Japan versus the West was strangely, but perhaps unsurprisingly, mimicking my own dichotomy between being abroad as a woman of color and American. As I found myself constantly switching environments, I also had to navigate being one of very few non-white tourists, but still being a tourist. I felt burdened by guilt each time yet another local had to switch to English to speak with me or I could not remember the right words in Japanese or could not produce the correct amount of currency. Each of these moments have been reminders of my American privilege and how they are going to be critical in traveling to these countries. For, each time I fail to fit in, I will be accommodated because I am American. It is also a stark contrast to the experiences my own parents had in immigrating to the U.S., and the experiences that many American immigrants have, in being shamed to learn and adapt as quickly as they can. These humbling reminders of my privilege have already made me more critical of my own actions, but also increased my desire to better understand my role as a woman of color in the West, a first generation American, and an individual who wants to create better policies for immigrant communities. Although it is easy for me to remove blame because of my target identities, it is as important, if not more so, for me to accept responsibility for the harm that my agent identities can and will do. It is only through this acceptance that I will be able to learn and move forward, becoming a better ally for many communities, as is my goal throughout this trip. Type of Japanese art that started to form during the Meiji period. Although still having a clear influence from Japanese scenery, the artistic style, brush strokes, and use of shading is more Western. These next few days, as I visit Hiroshima and Nagasaki, and their respective memorials and museums, will allow me to continue to reflect on my identity as an American in Japan. Although the process has certainly been difficult so far, I'm looking forward to better understanding my social identities within different contexts, and learning more about Japanese history from the country's own perspective. As I finally have a moment to myself, I take a deep breath. I think today arrived both slower and faster than we all expected. I still remember, 7 months ago, when I found out that I would be spending the year after graduation around the world. I'm not sure if my shock ever wore off, but I hope that I have been able to prepare myself in small and large ways. I slowly began introducing myself to international travel, first through a spring break trip to Spain, and then a month-long study abroad trip to South Africa. I learned how international travel can be incredibly challenging and rewarding, but it requires one to allow discomfort, and to sit in that discomfort and realize the reasons for it in order to allow growth. On top of Las Setas in Sevilla, España with my travel buddy & good friend, Ann. Only a few hours into my eight months as a Bonderman Fellow, I have already been uncomfortable. Whether it was the sweaty walk from one terminal to the other in the hot LA summer with a large backpack, or the 3 times I've already gotten lost in this airport, or the long lines, I'm learning to be confident in my abilities and see where they can take me. I would be lying if I didn't admit how nervous I am. Although I can no longer count the number of times I've traveled alone—be it a plane, bus, or train—and I've spent more time away from my family over the last four years than with them, this trip is a whole new adventure. One thing that my parents created for my brother and I from a very young age was a widespread sense of community. We moved quite frequently and we traveled often. Over the last few years, I've seen the benefit of this; there is no single place I call home and I often feel like I have "family" in many places that I go. My summer in New York allowed me to connect with the Sikh community in Manhattan through my internship. My summer in Washington, D.C. allowed me to reconnect with old Sikh youth camp friends. Although I have been "away from home" many times before, I always felt that home was with me. But, if there are any disadvantages to this great childhood, it is this: I have never learned to be uncomfortable. Whenever I had a challenge or conflict in front of me, I could often solve it by running to my local "family." I learned to use this as a coping mechanism and, as a result, I think did not give myself the benefit to grow from these difficulties. As I embark on my time of solo travel, I hope to continue to build relationships and families and friendships around the world, but I hope to use this time to also build myself and grow as a person. While saying goodbye to my family at the airport this morning, a sentiment that had bothered me for several months after accepting the fellowship briefly returned. I wondered, how strong will I be if I've hidden behind my community for this long? Can I really do this? As my mom pulled me into a hug, I felt her pushing something into my hand. It was money. I looked at her confused, as I had already taken cash out of the bank the night before. She simply said, "savaa lakh." I looked carefully and noticed that it was a dollar bill and a quarter. "To remember your Sikh tradition." I smiled, remembering the stories she had told me as a child. Although Sikhs have always been the minority, our armies would elicit the notion of savaa lakh, or that the strength of one Sikh could represent the strength of 125,000. I remembered the email a dear friend, Teresa Mathew, had sent me reminding me of the "army of people" rooting for me in the U.S. I may be alone, but I still have the strength and the army of my family and friends behind me, and it will be this love that will carry me through the next eight months and beyond. Although there are butterflies in my stomach and I know the 13 hour time difference will not be friendly to me, I am looking forward to eight months of discomfort, growth, change, and finding new homes. After all, "adventure is out there."